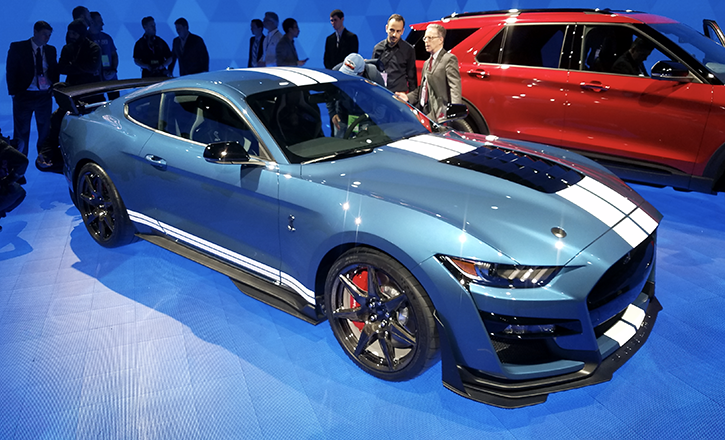 DETROIT—No more teasers: Ford has officially taken the wraps off the latest top-line high-performance version of its two-door sporty coupe at the 2019 North American International Auto Show in Detroit. The 2020 Ford Mustang Shelby GT500 will boast a supercharged 5.2-liter V8 producing more than 700 horsepower, which will make it the most powerful street-legal Ford ever. The aluminum alloy engine is built by hand, and includes high-flow aluminum cylinder heads, forged connecting rods, 2.65-liter roots-type supercharger with an air-to-liquid intercooler, and a structural oil pan with a patented active baffle system. The sole transmission is a Tremec 7-speed dual-clutch automatic; Ford notes that this gearbox shifts markedly faster than any manual transmission. Estimated 0-60-mph times are in the mid-3-second range, and projected quarter-mile times are under 11 seconds. Other powertrain features include multiple drive modes (including weather, sport, drag, and track); a carbon-fiber driveshaft; launch control; and a line-lock feature that enables tire-warming “burnouts” at the dragstrip. 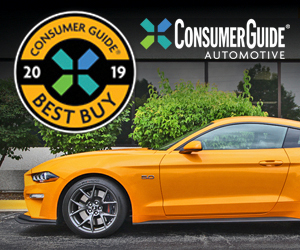 The chassis is upgraded via revised suspension geometry, new electric power steering, lighter-weight coil springs front and rear, and a next-generation version of Ford’s MagneRide adaptive suspension. The wheels are a massive 20 inches by 11 inches in front, and up to 20 x 11.5 in the rear; they mount to custom-spec Michelin Pilot Sport 4S tires or more-aggressive availale Pilot Cup Sport 2 tires. Ford says the massive Brembo brakes—16.5-inch two-piece rotors with six-piston calipers—are the largest ever available on an American sports coupe. 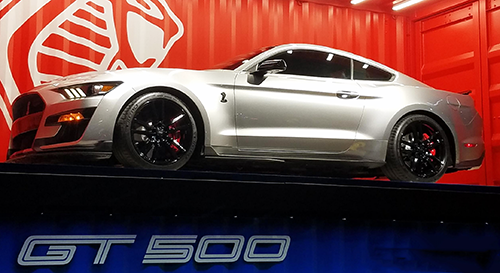 The GT500’s bodywork has been beefed up to house the plus-sized wheels and optimize cooling and aerodynamic performance; the double-sized front grille opening helps enable 50 percent more cooling pack airflow versus the Shelby GT350. 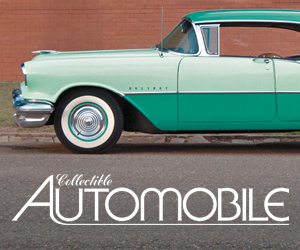 An available Handling Pack includes adjustable strut top mounts and a specialized spoiler. The available Carbon Fiber Track Pack goes further, with exposed 20-inch carbon fiber wheels that are 0.5 inches wider at the rear, Michelin Pilot Cup Sport 2 tires, rear-seat delete, and carbon-fiber body components, including an adjustable GT4 track wing. The 2020 Shelby GT500 is slated to arrive in dealerships this fall. 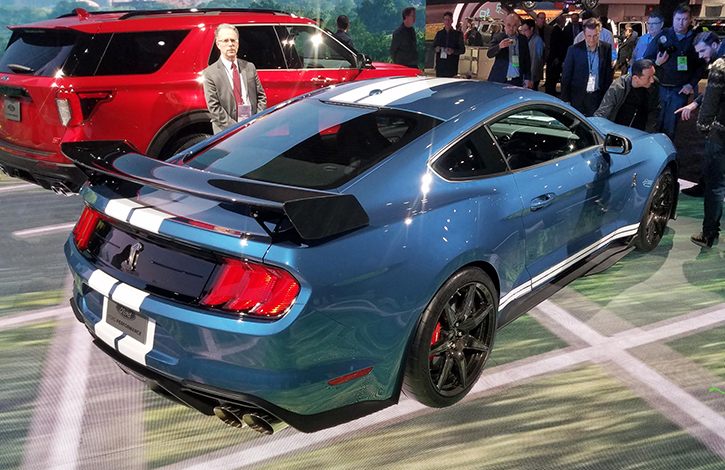 Ford is calling the new GT500 “the pinnacle of any pony car ever engineered by Ford Performance,” and in looking at the car’s specs, it’s hard to argue with that claim. Not only does the Chevrolet Camaro ZL1 have plenty to worry about here, there are likely a few luxury-brand exotics that will need to start looking over their shoulders as well. Ford hasn’t talked pricing yet, but we’d expect the new GT500 is also the priciest regular-production Mustang ever, in addition to being the most powerful… we’re guessing that prices might hover in the mid $80K range. Written by: Damon Bell on January 14, 2019.on February 28, 2019.